Casino bonuses are a common thing you will see at almost every online casino; however there are potentially a lot of misunderstandings as to how exactly they work and what you actually get. Here at EmuCasino as part of our transparent approach to how we do things, we’ve created this page to explain fully how the bonuses at EmuCasino work to avoid any confusion. We have 4 different bonuses types available at EmuCasino, all of which are available to the majority of players, although some have minimum requirements to claim or are restricted to set countries. 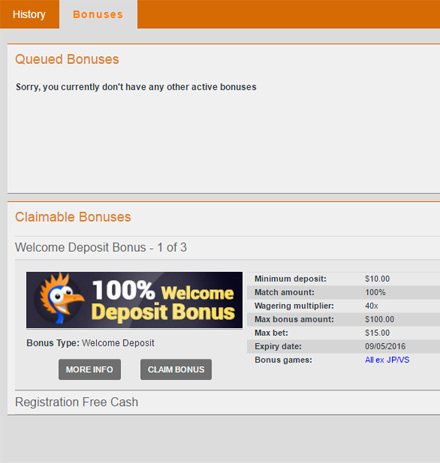 A type of non deposit bonus at EmuCasino is our Free Cash Bonus. These are very simple and as the name suggests requires no deposit to activate and use – simply login into your Emu Account, and claim it within the bonuses section, which gives you free cash to play with! Another type of non deposit bonus at EmuCasino are our Free Spins bonuses. These are very simple and as the name suggests, requires no deposit to activate and use – simply login into your Emu Account, and claim it within the bonuses section, which then gives you free spins on certain games! 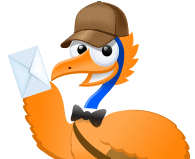 This type of bonus is used as part of the Welcome Bonus and also what we give away on a regular basis through our weekly promotions – this bonus gives you an extra boost when depositing into you Emu Account. This is sometimes also known as a Reload Bonus. What is a deposit MATCH bonus? This type of bonus is used from time to time as part of what we give away on a regular basis through our weekly promotions – this bonus gives you that little bit (sometimes a lot) extra when depositing cash into you Emu Account. But what is a deposit REWARD bonus? The below terminology is mostly logical and consistent across most online casinos but to avoid any confusion on what each of the terms mean, we’ve clarified each term below. When we send a bonus campaign out, the below terms will usually accompany the email. These terms will also be found on the EmuCasino promotional calendar. As and when needed, you can refer to this, or alternatively contact our customer support team. 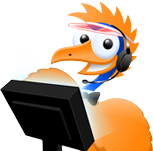 Activation: is what the requirements needed to be able to qualify and activate a specific bonus. Turnover: is the required amount of bets that are needed on the deposited/bonus amount for you to be able to cash out a bonus. An example of this is: With a bonus with a ‘100% match deposit up to $100 with 30 X turnover’ means $100 X 30 = $3,000. This is the total amount that is needed to be wagered to be able to cash out bonus money and associated winnings. Period of validity: is the number of days you have to clear the bonus. Any un-cleared bonuses and winnings originating from the bonus play, will expire after the set number of days have passed. The bonus must be used before the expiry date. Types of games: are the games categories and percentage of bet that contribute to the wager of the bonus, these can vary from bonus to bonus and will generally exclude jackpot games. 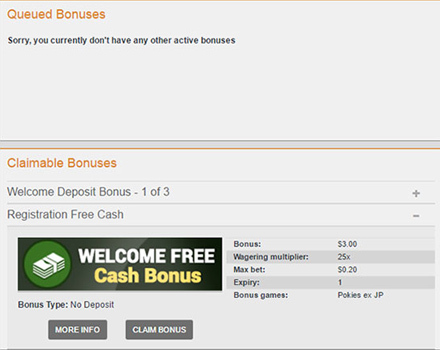 Payout: How your bonus will be paid out to your Cash Balance during or after the wagering period. Certain bonuses (usually the free cash/spins vouchers) will have max limits of what can be cashed out from the bonus. Cashout: on a bonus is when you qualify and are able to withdrawal your bonus cash funds. Free Spins: is either a set amount of free cash that can be used through a bonus voucher code or free spins on a specific game. For further information and to see the full casino bonus terms & conditions please go here.